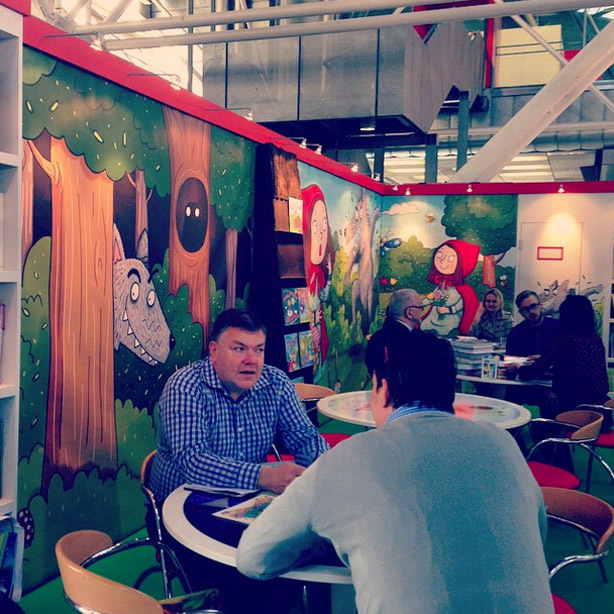 Recently traveled to Bologna, Italy for their annual Fiera di Libri. Was totally inspired by the festival and the artwork, and brought back with me a pile of books. Here's a few images from the fair. More on my Instagram: thevictorrobert. Does the U.S. have a minister of culture? Italy does. Here she is kicking things off, bestowing the Honorary Libri di Brian Wonders. Ha, just daydreaming, but that IS HER. I love her look. She may end up inspiring a character in one of my books. Getting there early on the first day pays off -- it's a mad rush of illustrators scrambling and clawing for a sliver of wall space. Of course, I had no idea. Fortunately, I had arrived early and prepared for anything. I unfurled a Brian Wonders print and made for the wall. For the most part, people were pinning up flyers and posters, but the serious ones were putting up large cut outs of their characters, dioramas offering trays of business cards, marionettes and even a miniature fairytale set. It was beautiful. This is what the walls looked like in the aftermath. I discovered where they keep all the literary agents -- rows and rows of them. This room went on for several blocks. One of my favorite illustrators, Emmanuelle Huodart. It was a treat to see her drawing.